IR: We love statement pieces. In fact, we love them so much we spend our days designing, building them, styling them, and putting them to market. And here's why: though design isn't always synonymous with art, we see the art in every piece we put our hearts into. 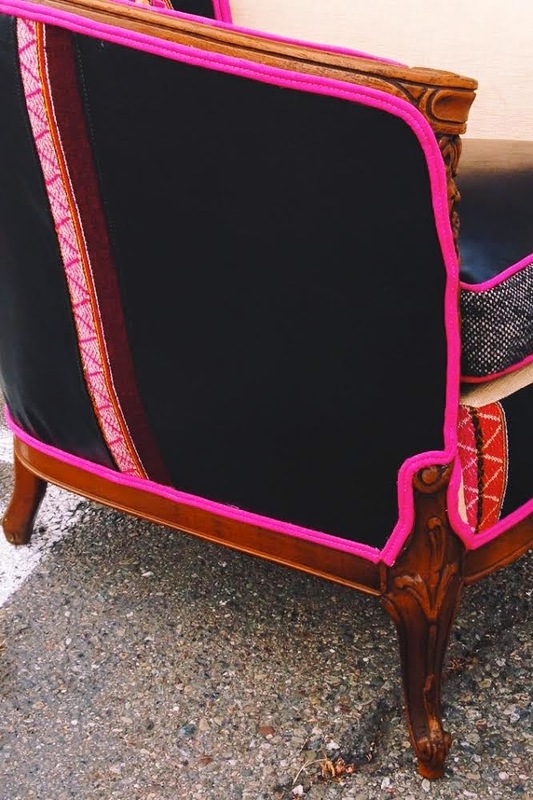 Owner and designer, Johnelle, personally has a major role in every design, artistically leading all projects undertaken here, and started her business designing and restoring furniture for the love of it, in addition to, of course, her uncommon knack, a talent and eye for it. Her artistic aesthetic is where the Mignonne brand came from, and with a background in fine arts, she creates pieces with acute attention to detail, as well as designing broad and cohesive interiors. 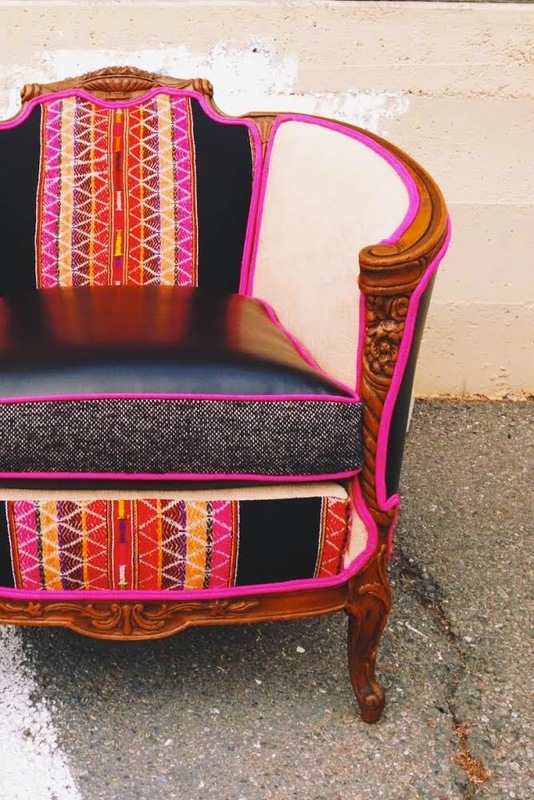 Our dazzling 'LA PAZ' chair, upholstered in hand-picked, one-of-a-kind textiles, like the Bolivian aguayo cloth and the well worn leather of a vintage jacket, is a stand alone piece, and a shinning example of furniture as art. Or is it art as furniture? 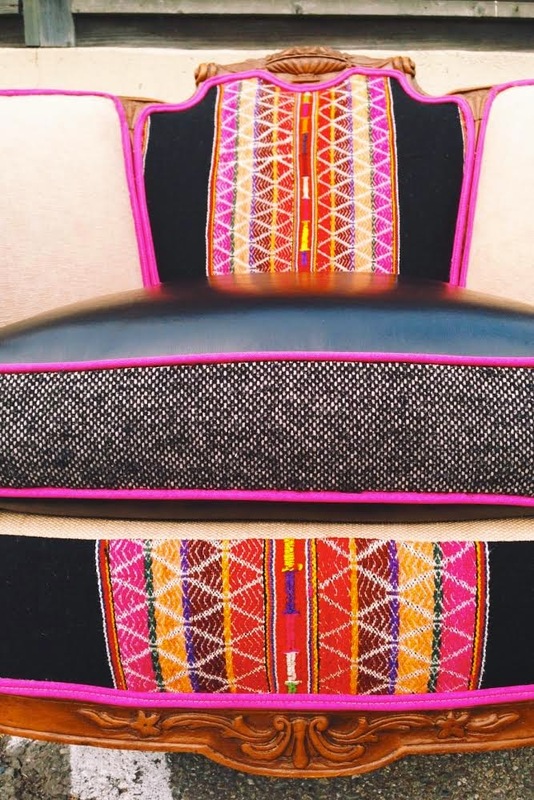 The upholstery, a collage in a color palette of Kahlo-esque vibrancy. 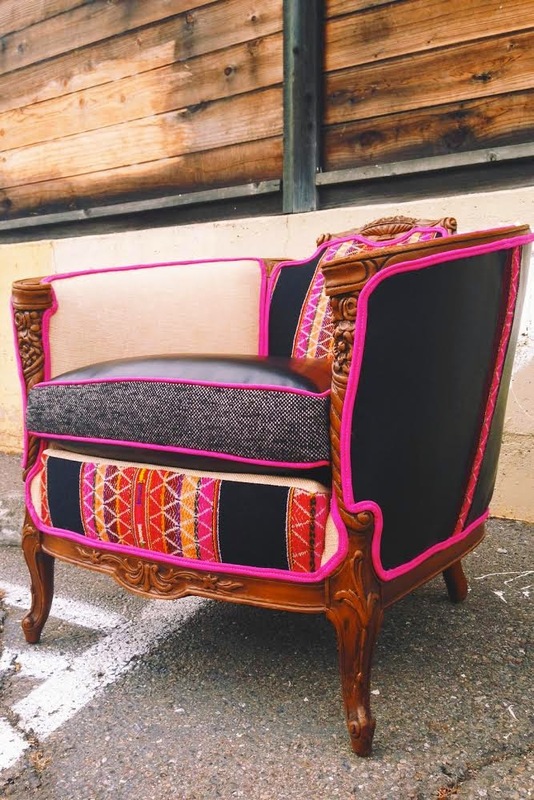 The pink, effervescent, double-welt piping draws the eye around the hand-carved, art nouveau wood frame with stark contrast, while the smooth and daring ebony leather simultaneously compliments it. 'LA PAZ's charisma lies not just in the bright colors that she dons, but in the combination of class and spice. She's outstanding, maybe even a bit shocking, but never is she offensive. Evoking emotion with soft and hard sides, this chair is a piece that can converse with all the ages. And I don't just mean by the appeal to the nubile, and those who've seen a few more seasons alike. In a classic room or a modern one, she's one chica who knows just what to do. All together empathetic and inspirational, and we just can't get over her and her show-stealing charm. 'LA PAZ' is available now in our West Berkeley storefront!